WHO is a lucky adopted dog? BENNY, HOWIE, ELI, JOE, and BISCUIT have all gone HOME! And Jane! Poor, sweet shy Jane. She is scared out of her wits, but couldn't be nicer about it. 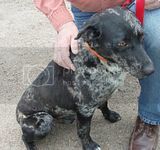 She is a 1 yr old blue heeler mix, the perfect compact size, and the most huggable dog I have ever met. She's dying to meet her perfect someone--please come fall in love with Jane! High five from Jamie. She's just cool. And I'm throwing in some Chico for good luck. Chico came to us frightened and cowering from the world...he's come SUCH a long way with the help of our staff, enrichment volunteers, and foster caregivers! Chico is 3 yrs old, loves gentle people (esp women) and other dogs, and is very eager to please...once he bonds with you, he's stuck like glue. 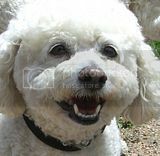 Chico is housetrained and has great manners. She's smart as a whip. Please come meet Chico! Thank you for reading our posts and sharing the news of adoptable dogs and cats with your friends--it means so much! SAVE A LIFE--ADOPT, don't buy. OPEN DAILY FOR ADOPTIONS *** LAST CHANCE TO BUY RAFFLE TICKETS!! And Boo Boo! Boo Boo is a 2 1/2 yr old yorkie-poo and he's a real lovebug under that mop of curly hair. He seems to like everyone he meets! Also still at IMHS and in need of homes are ROCKY the fabulous black lab/pit mix, HOSS and SCAMP the wirehaired Dachshund mixes, and SILVER and SCOUT the two-are-better-than-one package duo German Shepherd/husky/Pyrenees mixes! Your new best friend is waiting for you--ADOPT TODAY! IMHS OPEN DAILY for ADOPTIONS and RAFFLE TICKET SALES! Post subject: !! **DOGS-PUPPIES-DOGS!! 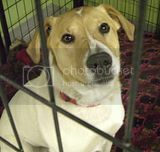 **-ADOPT-IMHS Open Daily! are silver and scout at the shelter or in foster? They are at the shelter - usually in the play yard unless it's raining/snowing. Calling all CHOCOLATE LAB LOVERS!! Check out our new PUP! Francesca is only 6 months old, appears to be a purebred chocolate Labrador Retriever, and is aching to get into a new home where she'll get lots of exercise and some basic training! She is loveable, fun, true to her breed she LOVES to fetch the tennis ball and squeaky toys, and seems to want to play with other dogs, too! Thanks for spreading the word about Francesca's need for a forever home! OPEN MEMORIAL DAY FOR ADOPTIONS from 8am - 11am!! Meet the sweetest little pumpkin-headed pitbull EVER! Maggie-beans is 2 yrs old and came to us via transfer from our friends at Denver shelter, where she had a huge fan following but due to breed restrictions, she could not be adopted out. IMHS to the rescue! Thank you, everyone, for reading these posts & sharing the stories, and for your compassion for animals! Calling all GIANT breed lovers--we have a WONDERFUL girl here who needs a forever home! 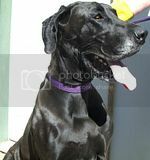 Daisy is a 4-yr old Great Dane who loves people and other dogs, and she desperately wants to find her new home! She seems to be a very well behaved dog and is reportedly housetrained. Daisy is terrific! Please help spread the word, we'd like to get her out of the shelter and into a home soon! Meet Daisy at IMHS any day--the shelter is open daily for adoptions from 11am - 4pm (open late til 7pm on Weds). Meet our NEW arrivals-- please spread the word about their need for forever homes! Emmitt! 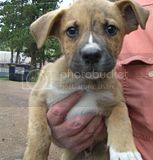 10 week old Shepherd (possible Boxer in there too) mix pup, male/neutered, friendly and social, and smart! Dixie! 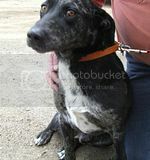 Smart and sensitive 3 yr old Collie mix, female, wants to be your buddy for life! Chapper! This male 5 yr old black-and-tan Coonhound mix is sweet with adults and mature kids, and likes other dogs, too! Also still at IMHS in need of homes are DAISY the 4-yr old GREAT DANE, HOSS and SCAMP the 1-yr old WIREHAIRED DACHSHUNDS, SILVER and SCOUT the white GERMAN SHEPHERD mixes, and GABBY the lovely senior BOXER mix. What are you waiting for? ADOPT! Your new best friend is waiting for you today! YOU can help the animals today-- LIKE us on FACEBOOK! Hi Everyone! Please spread the word about the lovely black Labs we have at IMHS in need of homes! Meet GINA! 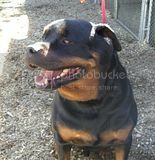 About 5 yrs old, LOVES to fetch the tennis ball, true to her breed, and would likely do well with kids or all ages. She is easy going and loves other dogs too! We also still have adorable PUPPIES and other wonderful dogs still at the shelter waiting for homes. What are you waiting for?--ADOPT! Samantha! 1 1/2 yr old border collie, very SMART! 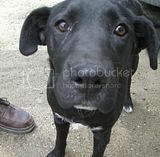 and sweet, seems to like both people and other dogs...needs someone to work her mind and help her fulfill her potential! Oh my favorite Chihuahua of all time...this fat munchkin just infuses everyone she meets with JOY for life! Rosita is 10 yrs old, healthy for her age, and loves everyone she meets including people and other dogs. Loves belly rubs! Rosita really is the best-natured Chihuahua I have ever met...She runs like a bullet and is sure to keep you smiling! Ruthie is a 1 yr old, female dachshund mix and she is lively and sweet, loves people and other dogs! Brody! Still at IMHS and in need of a home. Brody loves people of all ages and especially likes little dogs. He's got high energy but he's a loving dog. Bulldog mix, 2 yrs, housetrained! Dixie-Noodle! 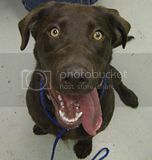 6 yrs old Labrador Retriever mix (a GREAT age for her breed combination!!). Dixie Noodle loves people and other dogs, too. She's really a lovely, lovely dog-- mature and sweet! Housetrained. Chapper is SO tired of shelter life! 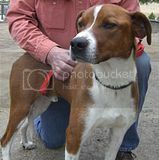 He's a medium-sized coonhound mix, really a terrific size. Chapper is about 5-6 yrs old and he is a NICE dog. Active and lively, he loves people and does very well with other dogs, too! Riley needs a friend!! He's such an adorable, sweet little guy. 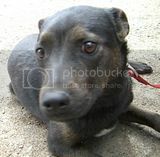 Looks like a terrier/yorkie mix, 2 yrs old, housetrained, active and happy with everyone he meets! Riley is good with dogs and may do well with cats, too! HOSS and SCAMP the wirehaired dachshunds are also still in our care and in need of homes! Come to IMHS to meet the adoptable dogs ANY day-- we're open every day for adoptions! !